I am proud to announce the opening of our new office, Concierge Dental Group in Williamsville, NY. Opened June 4, 2012, Concierge Dental Group has been a vision of partners Doctors Benjamin and Julia Oppenheimer for over a decade. The husband and wife team used their individual strengths both in the design and building of the office and in their dental care. Both are general dentists with expertise in different areas. 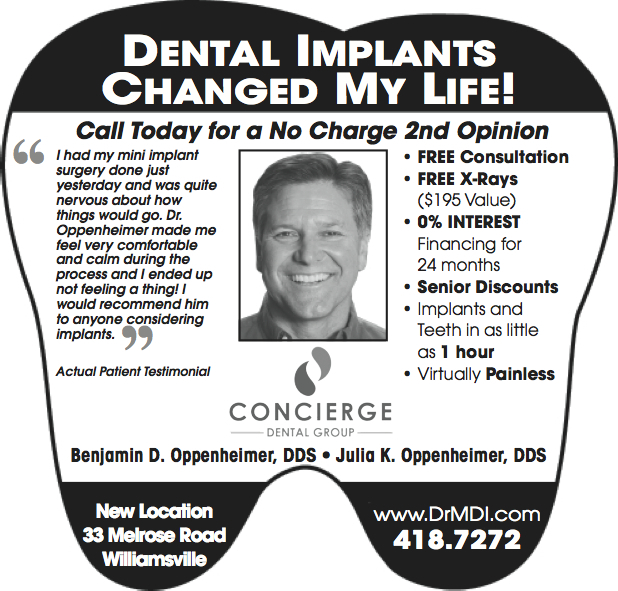 Dr. Ben's practice focuses on dental implants in Williamsville, NY while Dr. Julia treats patients for snoring and sleep apnea with simple dental appliances. Both also take care of all basic dental patient needs with treatments including hygiene, white fillings, porcelain crowns and bridges, veneers and mini dental implants with full or partial dentures. You might be surprised to know that about 30 million Americas are missing all their teeth in one or both jaws. In addition, according to the American Academy of Implant Dentistry (AAID) two in three Americans have missing teeth. The AARP says there is an “Over 50 Dental Crisis,” noting dental disease has become a silent epidemic among older Americans. The greatest concern is that older adults with missing teeth often have lost them to periodontal disease. This disease of the gums and bone can result in bacteria and infection migrating through the bloodstream to vital organs. Adults with missing teeth are also unable to eat properly resulting in nutritional deficiencies. Aside from dental and nutritional problems, missing teeth have a negative influence on self-confidence and social activities. Many family and social functions revolve around meals, and these situations can be difficult, if not embarrassing, for anyone who can’t chew properly. Also, when teeth are lost, the supporting jaw bone decreases as well causing shifting of adjacent teeth and negative changes to the bite. Some adults with missing teeth rely on bridgework or dentures, but these require grinding down healthy teeth to anchor each side of the bridge. Bridges also tend to fail after only 5-10 years due to tooth decay or heavy bite forces that loosen the anchor teeth. As a result teeth supporting the old bridge are often lost, requiring insertion of longer bridges that further compromise the situation. Finally, removable dentures are bulky, uncomfortable and can result in speaking and eating difficulties. It is no surprise that the AAID recommends dental implants as a better alternative to missing teeth. They preserve the jaw bone, do not decay, and function like natural teeth. Over the years there have been many innovations in implant dentistry, including 3D imaging, and the development of economical alternatives. One of these is mini implants. They are narrow, about the size of a toothpick, and can be used to stabilize a lower denture. In most cases, four mini implants are inserted in the front of the jaw using mild anesthesia. The denture is then carefully adjusted to allow it to snap onto the mini implants. If successful, the mini implants will firmly secure the lower denture and prevent slippage. Typically patients can eat lightly about an hour after the procedure. Today, implant dentists apply the principles of evidence-based dentistry in their practices. Evidence-based research holds great promise for developing streamlined dentistry that will make implants more affordable for greater numbers of prospective patients. Dr. Benjamin Oppenheimer is a leader in the field of Mini Dental Implants, and has taught hundreds of dentists how to use them. A frequent lecturer and author, he has helped hundreds of patients locally and nationally. Call 716-418-7272 for a free x-ray and Mini Dental Implant exam. Learn more at www.DrMDI.com. When David came in to see me he had just been laid off from work, and the prospect of going on interviews with two missing teeth was overwhelming. When he asked about mini-implants he was shocked to learn they cost 50% less than regular implants and wanted to know why. Approximately 50,000,000 people in the U.S. are "edentulous" (lacking teeth) and struggle daily with embarrassment due to missing teeth and discomfort due to loose or ill-fitting dentures, disagreeable breath, and the inability to enjoy the foods they love. While dental implants come in a variety of brands and sizes, mini dental implants (MDIs) have becoming increasingly popular due to improved technology and lower cost. An MDI is a miniature titanium screw that acts like the root of your tooth, is very thin and small in diameter, and easy to implant even in thin bone. MDIs can also be used to connect or cement to a crown or bridge, so they are fixed in place instead of having to be removed like a denture. Sometimes they are used to replace one or more teeth, or an entire arch of teeth. Today MDIs are FDA approved, and able to function as long-term supporting structures, rather than short-term or medium term devices. In fact, some have been successfully functioning in patients' jaws for several decades. But it is important to understand that all implant systems, as well as natural teeth, are subject to potential failure due to natural causes, including osteoporosis, poor oral hygiene, wear and tear, poor health, stressful biting habits, and lack of follow-up dental care. 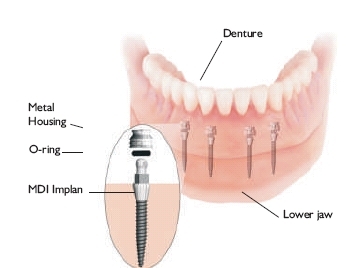 MDI implants, like regular dental implants, do not carry any actual or implied guarantee as to longevity. However, the loss of a mini dental implant is a far less critical event to a patient since it may be replaced at relatively minimal cost compared to conventional implants, and with minimal associated bone or gum deterioration. About the Author: Benjamin D. Oppenheimer, DDS provides both regular and mini dental implants (MDIS). He has lectured to thousands of dentists all over the world, and has written extensively on the subject, and placed thousands of dental implants in his career. He sees patients at his office at 2000 Eggert Road in Amherst, NY. To learn more visit www.drmdi.com. To schedule a free consultation and obtain information about a personalized treatment plan call 716-418-7272. I just got back from training 26 dentists from all over the country on mini dental implants. In these advanced courses I focus on helping the dentists increase the predictability of their mini dental implant cases. I have given presentations over 50 times on this subject and the same question comes up almost every course. Every body, Dentists and patients, want to know 'who is the best candidate for mini dental implant over-dentures'? Well, over the years I have helped hundreds of patients stabilize dentures in my dental office in Buffalo, NY with implants. Most often, patients are looking for a fast, easy and cost effective solution for their loose dentures. Accordingly, I recommend and patients often opt for the mini implants as opposed to standard diameter ones. In this post I'm not going to go into the benefits of one over the other, rather discuss the best candidates for the minis. In my opinion, there are two types of patients who are ideal candidates for MDI (mini dental implant) over-dentures. Firstly, a patient who has been wearing lower dentures for decades and has suffered the inevitable, significant bone resorption in both height and width. Most of these patients cannot wear their denture at all or if they do the denture shifts and moves all around and is extremely uncomfortable. At this point, all the denture adhesive in the world won't help the patient. These people may have been seeking help from dentists who place traditional dental implants and have been either offered a very expensive and time consuming procedure involving bone grafting or have been told that they are "not a candidate" for implants because of lack of bone. Mini dental implants are great options for these patients. The second group of patients who benefit most from the MDI are those who have had all their lower teeth removed and have had a lower immediate denture placed and been trying to adjust to it for about a year. In this situation the patient has had about a year of bone healing which is ideal for the minis. Some people will never be comfortable with a lower denture just need implants to be comfortable. These patients benefit from the immediate stability the MDIs offer and the newer immediate denture can often be used with the mini implants to decrease costs. Opportunities abound with new technology in dental implants today. If you fall into any of the groups above consider mini implants to solve your problems. If you live in the Buffalo and Western NY area call Dr. Oppenheimer at 716-418-7272 to schedule a free consultation on mini implants. If you are outside the area, go to mini dental implant solutions to find a qualified MDI dentist near you. Imagine living in Buffalo and not being able to eat the things we love including chicken wings and beef on 'weck', hamburger instead of steak, or giving up on corn on the cob or apples because it’s embarrassing. Dr. Benjamin Oppenheimer is one of the leading experts in the world on mini dental implants. 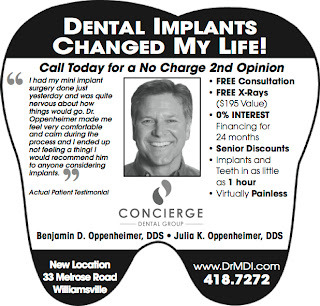 He offers free dental implant consultations, exam, x-rays and no interest two-year financing, 716-418-7272.